Born in a family of musicians originally from Moradabad, Murad Ali is a sixth generation sarangi player. The intensive training he had under his grandfather Ustad Siddique Ahmad Khan and father Ustad Ghulam Sabir Khan has stood him in good stead, and he is presently regarded as one of the leading sarangi players of the younger generation. Beginning his performing career at the early age of ten, Murad Ali won the first prize in the All India Radio national music competition held in 1992. An 'A' grade artiste of the All India Radio, he has also been a frequent performer at several music festivals in India and abroad. He has received accolades for his accompaniment to many noted vocalists and tabla players. Unfettered by orthodox musical beliefs, Murad Ali has on several occasions participated in cross-cultural and experimental musical endeavours. He had honor and privledge of playing sarangi for " Bharat Ratna Pt. Ravi Shankar ji"And got Pt. Ravi shankar ji’s Blessings. 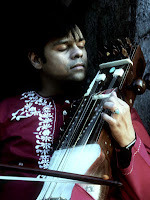 Murad Ali also has composed Music for his own Band Called SOUL- SAMVAAD and His Music Albums He had also Recorded his Sarangi Music for Bollywood & Hollywood Films like: Khamosh pani by: Sabiha Sumar. Music By: Shri Madan Gopal ji , Dance of the Wind By: Rajan Khosa. Music By: Smt Shubha Mudgal ji, Life Goes on. Music By: Soumik Dutta, West is West. Music By: Mr. Roblane & Shankar Ahsan Loy. , Lage Raho Munna Bhai. Music By: Shantanu Moitra, Laga Chunari Me Daag Music By: Shantanu Moitra, Khoya Khoya Chand Music By: Shantanu Moitra. Murad Ali got "SARANGI RATNA AWARD" from Ustad Ashique Ali Khan Memorial Society Delhi... 2010.Recently Murad Ali Have Got "USTAD BISMILLAH KHAN" YUVA PURASKAR 2009/2010 from Sangeet Natak Acadamy. Ustad Abdul Latif Khansahab Memorial Society By Madhya Pradesh Kala Parishad, Baajaa Gaajaa Music Festival Pune etc.....Few Major Music festivals in Abroad: Darbar Music festival London, Asian Music Circuit London, World Music Festival in Austria, World Music Festival in Holland, France Music Festival..Murad Ali has been performing in England, Germany, Russia, Isreal, Singapore, Japan, U.S.A. Tunisia, Indonesia , U.A.E , Morraco, South America, Egypt, Jordan, Iraq, Pakistan, Bangladesh,Sri Lanka , Mauritius, Reunion Island etc.